Curfew was on Friday extended to several areas of Kashmir to foil a planned march by separatists to Eidgah in old city area as normal life continued to remain paralysed for the 49th consecutive day in the Valley in the wake of violence following the killing of Hizbul Mujahideen militant Burhan Wani last month. 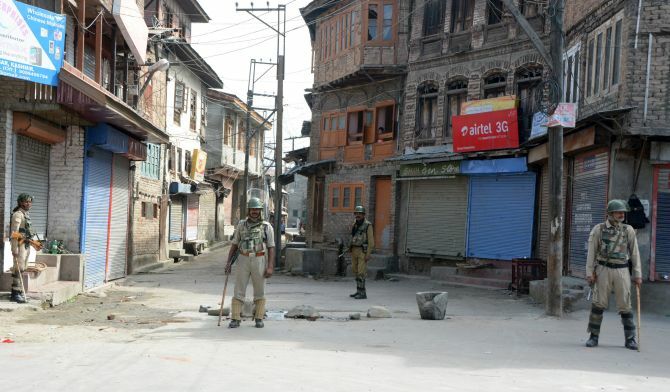 "Curfew has been extended to entire Srinagar district, Pulwama district and south Kashmir towns of Shopian and Anantnag," a police official said. The curfew was extended to thwart a march planned by separatist groups of Eidgah ground in Old city on Friday afternoon after prayers. The separatist camp, which is spearheading the agitation in the Valley over the civilian deaths during the protests against Wani's killing, have extended the strike call in the Valley till September 1.